A major decision in this process is choosing a fixed rate vs. adjustable rate mortgage. Buying a house is usually the largest investment you'll make in your lifetime, and the interest rate you pay on the mortgage can make a huge difference in the total cost of the loan. A major decision in this process is choosing a fixed rate vs. adjustable rate mortgage. Each choice has its advantages and disadvantages for your individual situation. 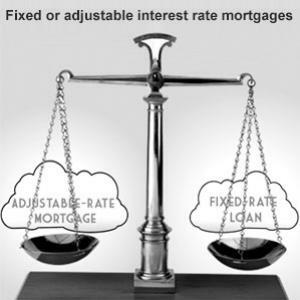 The adjustable-rate mortgage, or ARM, is an attractive choice when housing interest rates are low. ARMs typically offer lower rates – and thus, lower payments – in the early years of the loan term. ARMs are expressed in terms of the period when the low initial interest rate remains fixed, after which the variable rates kick in. In a 30-year loan, a 3by1 ARM offers a low, fixed interest rate for three years and adjusts annually for the next 27 years. A 5by1 mortgage offers a set rate for five years, with annual adjustments for the next 25 years. Other choices include a 7by1 and 10by1 ARM. The tradeoff inherent in an ARM is the possibility that interest rates will rise – sometimes significantly – after the introductory period is over. A fixed-rate mortgage offers the same interest rate throughout the life of the loan. This predictability helps homeowners who prefer financial stability and who don't want to take the risk that the interest rate can rise dramatically. In the 1970s, fixed 30-year mortgages rose from about 7.25 percent in 1970 to an eye-watering 17.5 percent in 1981. Homeowners with lower fixed interest rates were spared the pain as runaway inflation put homeownership out of reach for many Americans. In a low-rate environment, homeowners who wish to save some money must refinance the mortgage, which can cost time and several thousand dollars in closing costs. If you refinance, the lender will perform a credit check. If you experienced financial difficulties since you bought the house, or were unable to prevent identity theft, you may not be able to refinance at an attractive rate. The monthly payments are typically higher than those offered by an ARM with a low rate. The major difference between a fixed-rate mortgage and an ARM is who bears the risk when interest rates change. If rates increase while you hold a fixed-rate mortgage, you benefit from not paying a higher rate; however, the bank loses its opportunity to make more money on the increase. If you hold an ARM and interest rates increase, you have a higher mortgage payment, which is to the bank's benefit. If you plan to stay in your home for a short time, an ARM mortgage might be the best choice. A 7by1 or 10by1 ARM is especially attractive if you don't plan to stay in the house forever. If your plans change and if current rates are still low, you may choose to refinance to a fixed-rate loan before the rate adjusts. Also, if you expect your income to increase, an ARM with a low introductory rate may be a good option if you can handle larger payments. However, if your income outlook is uncertain or if you plan to stay in your home for a long time, a low fixed rate is a great choice. Another way to save money during the initial purchase or when you're refinancing, try negotiating for lower interest rates on your mortgage. Since the bank relies on fees and proceeds from the interest payments, you may need to offer something to the negotiation, such as having a sterling credit history, prior loans with the lender, or the willingness to take out a shorter loan term. When deciding whether to get a fixed-rate mortgage or an ARM, your individual situation is the major factor. If you plan to stay in your home for a long time, have a steady income, and can refinance your house if rates drop, a fixed-rate mortgage may be a good choice. You may prefer an adjustable-rate mortgage if you want a lower initial rate and payment but can afford a potentially larger payment as your income increases. An ARM may be suitable if you don't plan on staying in the house for a long time.